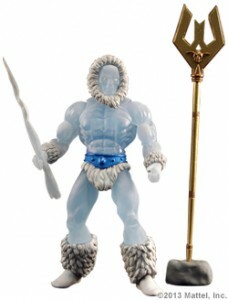 While Mattel's reveals of new action figures in their hit online exclusive toylines Master of the Universe Classics, Watchmen, and DC Universe Classics weren't supposed to be made until sometime this coming Sunday afternoon, official photos have leaked of some very cool upcoming figures and the prototype for the Castle Grayskull play set due to be released in December of this year.  Here's a look at the newest releases. Joel Schumacher's first proposal for Batman's costume. 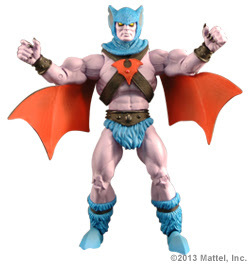 Batros appeared only in the season 2 episode "The Great Books Mystery" of Filmation's He-Man and the Masters of the Universe and was never made into a toy before. He's always been popular with fans, especially because he looks like he could fit in with the Evil Horde. I'm so excited for Castaspella, I'm not even going to make a joke. Appearing in both the vintage She-Ra: Princess of Power toy line and in multiple episodes of the cartoon, Castaspella is one of the most prominent members of the Great Rebellion and one of the most fan anticipated characters. 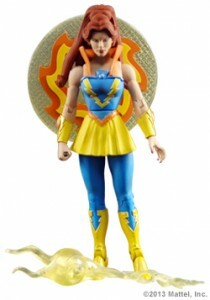 While she mainly looks to be modeled after her Filmation appearance, she does have the magical disc on her back which the original toy had. We have hidden a crab man in this picture- can you find him? 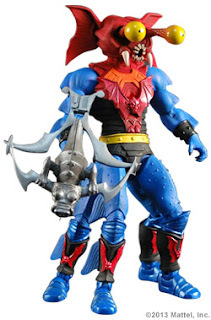 While Mattel offered this product as a sight unseen preorder last fall, fans may have another chance to preorder this product, although at a higher price than originally listed. 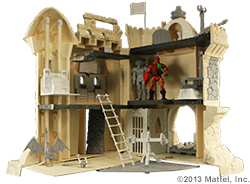 From the interior, we can see that this version of Castle Grayskull features many elements that appeared in both the original toy and the prototype toy designed by Mark Taylor. 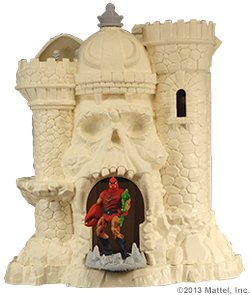 Check out the dungeon, the robot suit on the 2nd floor (it was just a piece of cardboard in the original toy), and the skulls atop the elevator. Things are looking good so far (if a tad bit undersized). Tan is the new Gray. 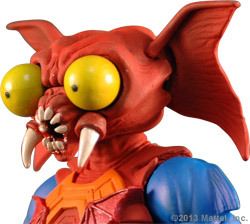 Appearing in both the vintage Masters of the Universe toy line and the She-Ra cartoon, Mantenna is the last of the original Evil Horde members to be made in MOTUC. He looks awesome and appears to have eye stalks that can be changed. "Anyone have any Clear Eyes?" 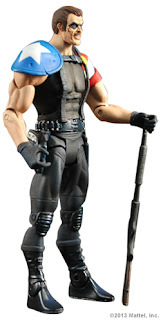 While we saw this figure revealed at Power-Con/Thunder-Con in September, he did not yet have his armor and helmet. The helmeted head looks like it will be a separate, interchangeable head, and I'm sure the armor is a removable piece also. Who the heck is making toys based off of my D&D character? Appearing only in two episodes of the Filmation cartoon, The House Of Shokoti parts 1 and 2, Shokoti is another fan requested character. 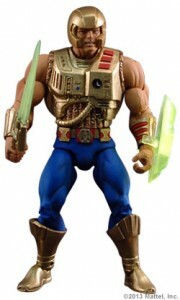 Since so many Filmation characters have been revealed at Toy Fair, this may add more weight to rumors that Mattel wants to create a special Filmation characters subscription for the MOTUC line. We'll learn more Sunday! The Huntress from Mattel's DC Universe line. The Comedian from Mattel's Watchmen line.